The New Anatolia system produces food for two important industrial colonies. A viral plague sweeps through New Anatolia, and the Galactic Confederation needs your ship to deliver the cure. But how can one virus afflict so many species? Maybe the nearby Carnifex Empire is to blame, or maybe the New Anatolian Independence League. The situation is tense, and many will die unless the crew intervenes. 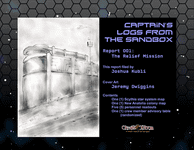 In this first issue of Captain's Log from the Sandbox, the crew travels to New Anatolia. Explore the seven worlds in the Scythia system, save hundreds of colonists in the colony. Face six mission complications, each with three twists, five NPCs, a table of space travel hazards, and a table of planetary hazards, ready for any space opera science fiction RPG.